Salem Neighborhoods. B. Comprehensive List. A preceding post defined neighborhood, distinguishing neighborhood from district from subdivision. To reiterate, a neighborhood is a spatially compact and cohesive region of a city that is diversified functionally: residential, retail / commercial, institutional, entertainment / recreational and light industrial. A District has the spatially compact and cohesive attribute down, but is not functionally diverse, usually exhibiting a single function, generally residential. A subdivision is even lesser, being strictly residential, and only a single type of residential at that. Beyond the basic definition, neighborhoods have other common attributes. A Neighborhood often has Ethnic Homogeneity (e.g. Chinatown, Little Italy). Salem too has ethnic neighborhoods. Neighborhood ethnicity can change over time. Salem too has changing neighborhoods. Neighborhood boundaries are not like rigid municipal boundaries, but are ill-defined and fluid. Salem too has ill-defined neighborhoods. A Neighborhood does not even have to be contained within a single municipality. Salem too has an example of such a neighborhood. A Neighborhood also has to have at least one central commercial area, be it a square (e.g. Copley Square in Back Bay) or corridor (Charles St in Beacon Hill). In the comprehensive list the commercial center is defined for each Salem neighborhood. The distinction between Neighborhood and District can be equivocal. When is a District large enough and functionally diverse enough to become a neighborhood? There are no hard and fast rules. In the listing that follows pains where made to separate neighborhoods from districts, but with caveats that others looking at same data would categorize differently. Since there is no compendium of Salem neighborhoods, what follows is largely my own creation, loosely following the list of Salem neighborhood associations maintained by the City of Salem. There is one compendium that does provide a list of Salem neighborhoods, but without boundaries or characteristics or histories or anything, and that is MACRIS, (MAssachusetts Cultural Resource Information System). MACRIS, run by the Massachusetts Historical Commission out of the office of the Secretary of the Commonwealth of Massachusetts, has since the 1970’s been compiling a resource of every aged building, burial ground, object or structure in every city or town in Massachusetts, complete with dates, owners, and where available vintage photographs. And best of all MACRIS is free. Many an hour has been wasted occupied by this blogger searching MACRIS, with many of the vintage photos posted on this blog coming from MACRIS. So with the MACRIS list as antecedent here goes. In what follows neighborhood names are in UPPER CASE and district names are in Title Case. This list gives boundary definitions, brief history, and no more than two notable sights per neighborhood / district. In a following blog post the justification behind defining each area as a neighborhood or district will be provided. Since this is a blog about Gallows Hill, the list of Salem Neighborhoods and Districts naturally enough starts with – ahem – Gallows Hill. Roughly the large hill extending from Highland Ave to Peabody City line in one direction; and from Boston St area to the top of Gallows Hill in the other direction. Originally developed in the mid-19th century, with mostly gablefront homes built to house workers at the nearby leather factories then springing throughout the neighborhood. Notable sights include Proctor’s Ledge, the site of the witchcraft hysteria hangings in 1692, and the origin site of the Great Salem Fire of 1914. Commercial center is the length of Boston Street. For longer than a century was Salem’s Ethnic Irish Community. Blubber Hollow A district of Gallows Hill, at the seams of the McIntire, Mack Park, and Gallows Hill areas along Bridge and Boston Streets. Originally named for the whale oil rendered here in the 17th and 18th centuries. In the 19th century the area became home to many tanneries and complementary industries like shoe manufacturing. The Great Salem Fire of 1914 started in a leather factory at the corner of Boston and Bridge Streets. Witchcraft Heights late 20th century extension of Gallows Hill neighborhood, from the top of Gallows Hill marked by the water tower back to approximately Marlborough Road. A subdivision, not a distinct district, so in this listing is placed within the Gallows Hill neighborhood. Exclusively single-family residential, cookie-cutter split levels and raised ranches mostly. The more westerly of Salem’s two necks, extending along Bridge Street from downtown up to the bridge at the tip of the neck connecting Salem to Beverly. Bridge Street Neck was the landing site in 1626 of the original English colonists led by Roger Conant. Settlers from an larger expedition from England in 1628, led by John Endecott, pushed the settlement further up the North River estuary to about where the train station is today. A bridge to central Beverly has been at the tip of the neck since 1788. The more easterly of Salem’s two edge peninsulas, extending from the Webb St (what used to be called Neck Gate) axis to the tip of the peninsula. Notable sights are Winter Island and Salem Willows. Commercial center is the Salem Willows. First developed as a summer resort area in the late 19th century connected to central Salem by trolley; by mid-20th century converted fully to year-round homes. Former Ethnic Neighborhoods of Salem. Irish on Gallows Hill; French-Canadian in The Point; Polish in the Waterfront District; Italian on Mill Hill. From the Jackson St / Boston St axis on the westerly side east to the Collins Cove / Webb St axis on the easterly side, and from the North River to Salem Harbor and Channel in the other direction. Contains the Central Business District, the commercial core of Salem, as well as several outlying predominantly residential districts. Central Business District From the North Street / Summer Street axis east to the Salem Common, and from the North River south to Salem Harbor. The Salem courthouses, City of Salem municipal offices, the commuter rail station, and most tourist attractions are here. Among the plentiful notable sights will mention here only the Essex Street Pedestrian Mall and the Peabody-Essex Museum. Commercial core is the streets around Town House Square a.k.a. Lappin Park. McIntire Historic District Extends from the North Street / Summer Street axis on the east side east to the Boston St / Jackson Street axis, and from North River on the north south to Broad Street. Includes the Chestnut Street District listed on the National Register of Historic Places. Named after the architect and Salem resident Samuel McIntire, a progenitor of Federal style architecture. The neighborhood was originally built off the wealth made in the Old China Trade by Salem’s merchants. Notable grand historic homes include the Peirce-Nichols House and The Witch House. Salem Common the district just east of the Central Business District comprised of the Washington Square streets around the Salem Common and all the streets leading into Washington Square. Noted for the grand Federal mansions facing the Common, Salem’s grandest and oldest park. Site of the first muster. Attractions include the original Salem Witch Museum in the former Second Church and the Hawthorne Hotel. Derby Street / Waterfront District The former wharf area, extending along Derby Street and the waterfront from downtown up to the base of Salem Neck. Notable sights include The House of Seven Gables and the Salem Maritime National Historic Site. From the late 19th century until the late 20th century was the location of a flourishing Ethnic Polish community, replete with shops and markets and once even a branch library catering to Polish-speaking residents. Mill Hill A downtown district extending from the former Mill Pond (now Riley Plaza) up to the Jackson St axis, and in the other direction from the Norman / Broad St axis to the old railroad yards behind Jefferson Ave. Once a Little Italy district populated by Italian immigrants in a tight knot around St. Mary’s Italian Church, replete with shops and markets catering to Italian-speaking residents. Before Italian immigrants moved in the area was known variously as Knockers Hole (from the shipbuilding sheds along Mill Pond who “knocked” wooden planks together) or Roast Meat Hill (origin unknown) and was the center of a small mid-19th century African-American community. Today also known as the Greater Endicott Street area. 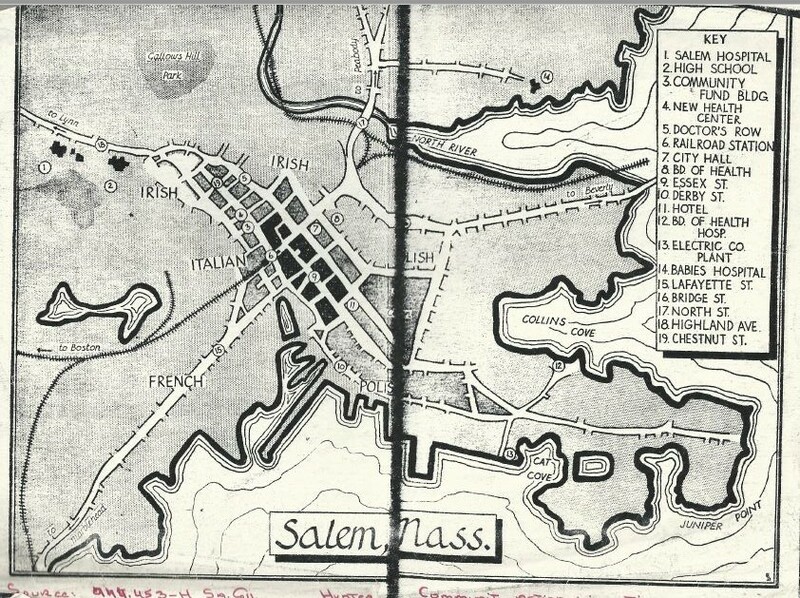 Salem Neighborhoods overlaid on 1891 map of Salem. Everything to the left of the dotted line was developed only in the last century of Salem’s nearly four centuries of existence. In colonial times this neighborhood, originally called Stage Point, was a peninsula jutting into Salem Harbor just across the Harbor Channel, separated from downtown by Mill Pond and the South River Channel. Filling in of all of the pond and most of the channel has left The Point more a promontory today than a peninsula. In the 1840’s the placement of Naumkeag Steam Cotton Mills (later the Pequot Mills) at the tip of The Point, for a long time the largest cotton cloth mill in America, created a great need for immigrant labor. This need was satisfied by a shunt of impoverished workers from Quebec, who filled the tenements that arose on the streets near the Mill, creating a vibrant Quebecois ethnic neighborhood focused around St. Joseph French Catholic Church, so French that its name was once rendered in French as le quartier le Pointe. The Point neighborhood and the mills were quickly rebuilt after the Great Salem Fire on 1914 obliterated both, but the Mills could not survive the cotton industry moving south, and in 1953 Pequot Mills closed for good. Any remaining French-Canadians who had not already translocated to Castle Hill moved out. The Mills property was converted to the Shetland Park industrial park in 1958, and in the 1960’s abandoned (and cheap) properties began to be filled by Hispanic immigrants, mostly Dominican but also from all over the Caribbean. Thriving bodegas replaced former pastisseries and charcuteries, and the neighborhood renaissanced as el barrio el Punto. Officially designated boundaries of The Point. The only such official map of any Salem neighborhood that can be readily located. Today The Point is the only ethnic neighborhood still extant in Salem. True to its Hispanic heritage, tenement walls throughout the neighborhood are resplendent with colorful murals. In a marker of its reach, The Point is the only Salem neighborhood with a separate wikipedia page and an officially designated map of its boundaries. Commercial centers are Congress St and the portion of Lafayette Avenue that passes through The Point before entering the South Salem neighborhood. Several of the spectacular murals that inhabit The Point. The area from the southern edge of The Point (roughly Palmer Cove axis) south along Lafayette Ave. down to the Salem State University area, and from Salem Harbor to commuter rail tracks in the other axis. Mostly farms and estates until Salem State (then Salem Normal School) moved its campus to a “rural” location in 1896, after which the spaces between downtown and the campus quickly filled with homes and apartment buildings in late Victorian styles. Commercial center is the length of Lafayette Avenue. The Great Fire originated at 55 Boston St in Gallows Hill, took out the far edge of the McIntire District, nearly all of the Mill Hill, annihilated The Point, skirted the Central Business District, and was spreading into the Waterfront District on one side and South Salem on the other side before it was finally repulsed. The area across the North River from central Salem up to the Peabody city line south to north, from Gallows Hill / Blubber Hollow to the Danvers River in the other axis. Up until the late 19th century was mostly fields and orchards, apart from a line of factories along the North River. By the early 20th century estates and pastures got subdivided into home lots. In 1775 the North River Bridge was the scene of Leslie’s Retreat the first armed albeit non-shooting military engagement of the American Revolution. Commercial center is the length of North Street. Mack Park The portion of North Salem west of North Street around Mack Park, formerly Ledge Hill Park. Northfields The portion of North Salem east of North Street around Greenlawn Cemetery. The hills and ledges around where Jefferson Ave crosses the MBTA railroad tracks, roughly from Mill Hill in central Salem down to Salem State University in South Salem. Commercial center is the length of Jefferson Avenue. Highland Park, a.k.a. Salem Woods, the largest and most wild of Salem’s parks, is the most notable attraction of Castle Hill. The area was mostly farms and quarries until the early 20th century, when French Canadian immigrants began to settle around St. Anne’s French Catholic Church atop Castle Hill, leaving their original settlement in The Point, a migration accelerated when The Point was wiped out by the Great Salem Fire of 1914. Salem’s southernmost neighborhood is around Vinnin Square (the conjunction of Loring Ave, Paradise Road, Vinnin St and Salem St) up to Salem State campus. The neighborhood includes portions of the neighboring towns of Marblehead and Swampscott. Commercial entities primarily on the Swampscott side, the Salem side primarily residential. Developed from the mid to late 20th century, predominantly single family homes in mid-20th century styles. Not a neighborhood or even a district, but a Community, consisting of all the leftover parts of southwestern Salem along both sides of Highland Ave towards the border with Lynn. Undeveloped until the last third of the 20th century, when little by little filled in with strip shopping malls and isolated subdivisions unconnected to each other. Often Witchcraft Heights is included in West Salem, but in this compilation it’s appended to the Gallows Hill neighborhood. But Wait There’s More. Spring Construction Update Continued. Two further parcels merit attention in this series of Construction Updates in Blubber Hollow. A large lot at this address was for decades home to the Bridge St Auto Service. Passersby on Bridge St may have noticed that it, and its erstwhile companion business Morneau Bros. Oil, are no longer resident. Bridge St Auto Service has closed shop for good, while Morneau Bros. is still in business at a new location. In December the Castle Hill Group, LLP, represented by well-known local attorney Stephen Lovely (husband to State Senator Joan Lovely), got approval for four multi-family buildings on the 1/4 acre site. And just last week a massive excavator was parked at the site, so perhaps demolition is to start soon. Plans seem to have been approved under the radar with little notice from the “undevelopment brigands” of the McIntire District, who’ve been known to hold up all other development plans in or near Blubber Hollow, sometimes for decades. If this project does go forward it’ll be in record time for a Salem project. Generations of Salem teens knew the back lot of 331 Bridge St as a great place to go “parking” on a Saturday date. Convenient. Quiet. Hidden. Going a block further along Bridge St come to this address, the back of the recent conversion of the former St. James convent and school offices at 162 Federal Street into eight apartments. Since historic preservation tax credits were used to fund the conversion, the units have to remain apartments for five years, after which they could remain apartments or be converted into condos, depending on the discretion of the owners. Several apartments are now occupied; presumably the remainder will be occupied shortly. For decades this sign announcing the busy mass schedule stood behind the convent on Bridge St. When the new parking lot behind the rehabbed building was paved over this winter the sign was cut down and unceremoniously dumped behind a remaining storage bin. The former St James Parish has fallen on extreme hard times, this photo emblematic of said hard times. The discarded liquor bottle a lovely touch. And did check the web address at the bottom of the sign. The link is dead, but does date the last painting of the sign to the late 90’s. How quickly the once mighty have fallen. Neglected to mention earlier that the ATG recreational marijuana dispensary in Blubber Hollow at this address still is “temporarily” closed due to “corrupted data” in the tracking system. Six weeks on the accounting discrepancies have yet to be resolved. ATG was the first dispensary to open in Greater Boston, and until the opening of a dispensary in Brookline last week, the only one. It’s closure, however temporary, leaves a hole in Blubber Hollow, indeed in the entire Greater Boston area. Construction in Blubber Hollow. Spring 2019 Update. Left this thread of construction updates by the wayside for some time, given that little goes on during the winter months. But with sunnier days activity has returned to Blubber Hollow, so another update is past due. Starting from the west and proceeding east along the North River come first to River Rock Apartments and townhouses squeezed onto the ledge between Boston and Goodhue Streets. When last visited the central apartment house was completed only needing interior trim and paint, while the northerly townhouses had been topped off with interior utility work commencing, and the southerly townhouses having the foundation marked off with steel posts but concrete not poured. Months later the status remains much the same. Trim on the apartments is completed but with landscaping still incomplete the building cannot be occupied; northerly townhouses have all utilities in place and trim work commencing; southerly townhouses still a shell of a foundation. Indeed progress seems to have stepped back a bit, what with the westerly brick parapet, completed months ago, now wrapped in tarps, perhaps for some unseen brickwork repointing. Opening is still promised by mid-spring, with applications for both apartment rentals and townhouse ownership being taken now. Up Goodhue St from River Rock where it merges into Grove St we come to the site of the former Salem and Oil Grease. When last visited on these pages the nearly century-old main buildings had been demolished, leaving the foundation and two newer cinder block buildings in place when heavy equipment was withdrawn for the winter. Heavy equipment has returned, and in a sure sign that this time the demolition team is serious a Porta-potty has been placed on the site. But the two cinder block buildings, though interiors have been ripped out, still stand, at least partially. Test digs, looking for toxic droppings perhaps, dot the site. Before demolition the enormous Salem Suede building (forefront) and the smaller Bonfanti Leather building (blue dot) fill the site where Riverview Place apartments will soon stand. The former building is about twice the scale of the replacement apartments. only to themselves pull out, citing an inability to get sufficient financial backing. In 2018 a third development team came on board. In Spring 2019 heavy machinery and laborers now fill the site, digging and marking and surveying. Here’s to hope that the third time is the charm. Salem Suede closed shop decades ago, and the eyesore of a vacant lot has since been home to nobody but numerous murine vermin. Development of the aforementioned Salem Oil & Grease site was itself delayed for some ten years when the first developer pulled out, citing – speak up if this has been heard before – an inability to get sufficient financial backing. It’s a game that gets played often in Salem. A local development firm (well-capitalized national firms don’t even consider Salem) plans a large project with expectation of reasonable ROI. Neighbors and city council raise hue and cry about the “massive” size of the proposal, so the developer cuts the scale way back to eventually get city approval. With approved plans in hand the project is shopped around to investment firms. After running the numbers all deem the project marginal, money-wise. Unable to get financial backing the developer sells out to someone else, following the dictum of “somewhere there’s a bigger fool than I”. The project is stalled while the bigger fool reclimbs the chain of needed approvals and permits, only to then itself face difficulty getting needed capital. Around and around the “undevelopment” carousel goes / if it ever stops nobody knows. Continuing downriver we come to Ice Cream Way on Mason Street, site of the former Bay State Creamery. Progress has been substantial on the conversion of the former creamery into six two-story luxury apartments. Of the three townhouse buildings to surround the creamery building, the first, which incorporated an existing two-family Queen Anne house, is completed and occupied; the corner building is erected and going full speed on interior work; the third is still only a dream. The Smithsonian Channel on Monday March 4 kicked off this year’s season of America’s Hidden Stories with an episode dedicated to Salem’s Secrets, covering – what else – the witchcraft trials of 1692. Watching the episode in full requires a premium cable package or an online subscription to Smithsonian, but a segment of the episode covering how Proctor’s Ledge was identified as the hanging site is available for free. Dedicated sleuthing by researchers uncovered a courtroom interrogation of Rebecca Eames, herself accused of witchcraft and arrested the morning of the hangings. She was being transported to the Salem Jail, but the hangings were ongoing and so she was left “at a house below the hill” to view the spectacle. In the interrogation she reports being able to see “a few folks being executed”. From the house now long gone, but today 19 Boston St, Eames “would have had a clear view of high ground”. In the video clip, two of the four researchers (Marilynne Roach and Benjamin Ray) who confirmed the site are seen walking along Boston Street, map in hand, stopping at 19 Boston St. Their surprise “Well, It’s a laundromat” brings to mind the headline in the Huffington Post the day the researchers’ findings were announced: “Salem Witch Trials Execution Site Found, And It’s Behind A Walgreens“. So much history hidden in unremarkable, forgettable places. Given the wide notice given to the Smithsonian Channel, the Sunshine Laundry could get a lot of tourist attention. (Wash your clothes while viewing the Witchcraft Trials Memorial). Perhaps eventually a historic plaque will be placed upon its wall? Even the Salem Auto Body in front of Proctor’s Ledge might get more attention. And of course the Smithsonian episode can only drive more traffic to the Proctor’s Ledge Memorial, the most historic site on Gallows Hill. The closure of Mansell Playground portion of Gallows Hill Park in late December, due to toxic soil contamination, has in late January been cemented by erection of a six-foot chain link fence about the area. The flimsy orange netting originally installed had blown over in many places, a decay possibly accelerated by boarders in the adjacent skateboard yard testing their skills by leaping over the netting. No one is going to jump, climb, or leap over the replacement fence. The competence that be the Parks and Rec Department did see to it that two of the three trash barrels servicing the park got trapped within the fence. As well as a personal garbage barrel a neighbor provided to collect recyclable items. The remaining barrel, despite getting emptied twice a week, cannot handle the increased use, meaning that the remainder of the park, already awash in litter and bags of dog poop, will only become more so. Extreme cold mitigates trash accumulation only slightly. The tarps along the ground visible in the photo represent places dug up for soil testing. Once the boundaries of the soil contamination are demarcated, then a strategy for containing the contaminated soil can be devised, be it removal or encapsulation. It’s likely that the contaminated area will coincide with the sluice pond behind the immense tannery that a century ago occupied what is now Mansell Playground. Expectations are that containment will commence at the earliest in mid-spring, so it’s likely that Mansell Playground will be closed to public use for most of 2019. So mid-summer basketball tournaments not, late summer cheerleading classes not, toddlers spending leisure time on the swings not. Such are the local consequences of deindustrialization. Salem Neighborhoods. A. What is a Neighborhood? Gallows Hill is a historic notable neighborhood in Salem MA. It is the centerpiece of this blog. There are other historic notable neighborhoods in Salem. In compiling post after post about this one neighborhood, it has been slowly realized that there is NO comprehensive listing of the neighborhoods of Salem, compiling names, boundaries, characteristics, and the like. Not in the City of Salem records, not on Wikipedia, not in Historic Salem, not anywhere that can be found. Such an absence is most unusual. Other cities devote considerable resources to the definitions and characteristics of their constituent neighborhoods. In Boston for the past few decades that responsibility has fallen to the Boston Planning and Development Agency (née the Boston Redevelopment Authority, a name considered too stern, too authoritarian, to retain). The BPDA provides profiles, maps, development details, histories, of each and every Boston neighborhood. The site is a pleasure to browse. Other repositories of Boston, like Universal Hub and Boston Curbed, take their neighborhood designations from BPDA, with minor tweaks. Even neighboring Beverly, a city often in the shadow of Salem, is aware of their neighborhoods. But Salem — nothing. So as an unpaid public service, this blog will compile and list the first comprehensive description of ALL Salem neighborhoods. Before getting to that ultimate listing (in a subsequent post), must first deal with the penultimate question of exactly What is a Neighborhood? There’s a lot of meaning to break out there, so let’s go step by step. In all the breakouts that follow most examples are taken from the neighborhoods of Boston (courtesy of BPDA), for it is those that local readers would be most familiar with. compact and cohesive, not stringing through many areas of the city like a gerrymandered electoral district. Pennsylvania’s former 7th Congressional District. So many neighborhoods sliced and diced. have fuzzy geographical boundaries, so it is often difficult to tell where one starts and another ends. Ordinarily, boundaries between neighborhoods are set by major geographical landmarks (rivers, highways, avenues, lakes). But as the geography changes, so then can the boundaries. e.g. South Boston – Roxbury border was set by the South Bay inlet. As South Bay was filled in the border became ever more nebulous, until now it’s unclear whether the South Bay area (Massachusetts Ave and Southampton St) belongs to one or the other neighborhood. Today, the BPDA puts most of South Bay in South Boston, but that could change. As it is, the boundaries of Mattapan change every time BPDA updates its neighborhood maps. In 1884 South Bay separates South Boston (center) from Roxbury (lower left), and for that matter from Dorchester (bottom). boundaries are fluid. As noted in the previous bullet point, demarcations between neighborhoods are ever changing. Second, new neighborhoods can split off from previous neighborhoods, as areas of an older neighborhood become functionally distinct. Mission Hill, a long-term district of Roxbury, gradually became socially and commercially distinct from Roxbury until several decades ago the BRA gave it its independence. The Seaport is generally considered part of South Boston, but it is splitting apart from Southie, culturally, architecturally, and commercially. Soon the Seaport will secede from Southie (according to official arbiter that is the BPDA it already has, though BPDA anachronistically calls it the South Boston Waterfront and not the Seaport). though most neighborhoods are contained within a single municipality, some neighborhoods can cross city lines. An extreme example is Chestnut Hill, which contains portions of Brookline (Norfolk County), of Newton (Middlesex County), and of the Brighton and West Roxbury neighborhoods of Boston (Suffolk County). diverse in function: residential [single-family through multi-family through large-scale]; commercial (retail, offices, etc); industrial (auto repair, warehouses, carpentry shops, etc); institutional (colleges, churches, government offices, etc); recreation / entertainment (restaurants, parks, sports venues, etc). A true neighborhood ought to have most though not necessarily ALL of these diverse functions. exhibits great similarity in architecture style, unsurprisingly as neighborhoods are developed within a single generation. In Boston there’s no better example than red-bricked Beacon Hill townhouses. often but not necessarily homogeneous in ethnicity. This is the attribute that most urbanites are familiar with, thinking that a neighborhood is not a neighborhood unless it bears an ethnic identity. Think North End – Italian; South Boston – Irish; Roxbury – African; Chinatown – East Asian. Ethnicity is not prerequisite, however. Fenway is a distinctive neighborhood that’s never had any ethnic uniformity; Dorchester has always had every ethnic identity, not any one. ethnicity itself is fluid, as one ethnic group becomes established, pulls up tent poles and moves somewhere else, and is replaced by another ethnic group. It’s little appreciated that Roxbury, today Boston’s quintessential black neighborhood, was once predominantly Jewish, especially the Blue Hill Ave side. In the space of a decade, from the mid-50s to the mid-60s, it became overwhelmingly African (white flight can reach a tipping point quickly). Such ethnic displacement is today lamented as gentrification, as if it were new, but new it isn’t. Gentrification has always been a hallmark of a vibrant changing city. neighborhood activity is centered around a commercial square or corridor (Copley Square for Back Bay; Kenmore Square for Fenway). Larger neighborhoods sometimes have multiple centers (Roxbury with the triad Dudley Square, Egleston Square, and Grove Hall). names are historical and often quirky. They are not bestowed upon a neighborhood, but arise up organically. Some neighborhood names are considered distasteful, if not outright slanderous, with powers that be trying to dignify and replace the original name. The evocative Hell’s Kitchen in Manhattan is now officially the generic Clinton, but the change has not caught on and it shall always be Hell’s Kitchen (if ever watched West Side Story, that’s Hell’s Kitchen). A similar effort is underway in Boston to alter the Bullfinch Triangle District (what’s disreputable about that name) into the Uptown neighborhood. Will it catch on? employing a neighborhood name as a metonym is common. Beacon Hill as a stand in for Massachusetts state government; Fenway as stand in for Red Sox baseball. District and neighborhood are interchangable semantically, but there is a difference. A District is functionally a rump neighborhood, containing just one function of all the functions fulfilled by a full neighborhood. Downtown Boston meets all hallmarks of a neighborhood, but the Financial District (banking & investment), Downtown Crossing (predominantly shopping), Government Center (exclusively civic), Theater District (entertainment) and Quincy Market (predominately entertainment) are all single-function districts within the Downtown neighborhood. None is a stand-alone neighborhood. Subdivisions are exclusively residential with exclusionary zoning restrictions preventing any other use. Subdivisions do not have commercial or recreational or industrial or any other function inclusive. Therefore, one must drive out of the subdivision to fulfill any other function of daily living besides residing. Neighborhoods are self-contained; subdivisions not. Developers apply euphonic names to subdivisions to mimic organic neighborhood names (Rolling Glen Estates, Harmony Acres). Such names are cheesy and readily mocked, but they reveal a deep yearning to be like a neighborhood, though anything but a neighborhood. Neighborhood designations matter. They provide cultural and political cohesiveness. They provide a sense of connection. They provide a sense of origin (when Mark Wahlberg is interviewed he says he is from Daw-chesta not Boston. Other celebrities speak likewise). If nothing else, they provide soul to a city. A grievous sin of gerrymandering electoral districts, besides all else that the practice tarnishes, is that it shreds neighborhoods of a city into tiny inchoate parcels (see figure above). All character, all cohesiveness, is destroyed. Much as one has identity with a neighborhood, one should have identity with an electoral district. A gerrymandered district has no identity, no soul. The Proctor’s Ledge Memorial survived its second October Madness in fine mettle. The crowds have dissipated and the Memorial enters its winter slumber. The biggest bugaboo of local residents, traffic, never materialized as most visitors, in clots of three or four, walked from downtown attractions, phone GPS in hand. How does he know? This blogger lives in a house overlooking Proctor’s Ledge, and every glance out the living room window provides a census of activity. This year visitors followed Hebraic memorial tradition (thanks closing scene of Schindler’s List) and piled river stones atop the rough-hewn wall, so much so that neighbors had to send 311 messages to the City of Salem (here called SeeClickFixit but the same deal). Parks Dept. personnel in early November swept all the rocks into the trough at the base of the wall from whence they came. Another tradition that got out of hand this season was placing coins of small denomination atop the wall. The quarters, dimes and nickels were gratefully collected by the denizens of Boston Street Crossing, which became fully occupied by formerly homeless in mid-2018. For them the memorial is their backyard. But the pennies they generally let be. Oh the pennies! So many pennies! Going on past Thanksgiving passersby would sweep a handful of pennies into their pockets, until by New Years the pennies, so many pennies, were all gone. Perhaps even a few Part Dept. employees helped themselves to a handful? There might be a few pennies hiding in the turf above or the rock trough beneath, but it’s not worth the effort to pry them out. In any case the Memorial wall is now denuded of rocks and coins. Another tradition is the laying of shells, clam shells mostly, upon the wall, but luckily that custom never got out of hand. Of course there are the many flowers left, which are gathered weekly for compost. Lastly there’s the leaving of greeting cards, which if not rained upon are blown by the winds upwards of Gallows Hill. For residents wondering why memorial cards collect in their driveway, that’s why. Going into the New Year the Memorial is absent any offering, rarely visited. So it shall remain until pleasant spring weather again returns. Construction in Blubber Hollow. End-of-Year Assessment. The Blubber Hollow portion of Gallows Hill was once home to dozens of productive tanneries employing thousands of workers at peak in the early 20th century. Photos from that period show streets abuzz with people and carts. All those workers need places to sleep, eat, drink, and shop, so cheek by jowl with all those tanneries were apartments, diners, bars, and markets. When the leather industry collapsed post-WWII and all those tanneries disappeared so did all of those ancillary businesses. Blubber Hollow ‘hollowed’ out, and for the last 50 years or more its streets never abuzz with any activity. Finally, after decades of trying to build anew but coming up empty, perhaps the rebirth of Blubber Hollow began in earnest in 2018.
the new Salem Senior Community Life Center at 401 Bridge Street, at was once the out buildings of an enormous Sylvania Electronics plant, opened for business in September. The building is far from distinguished, resembling more than anything else the warehouses that once dotted the site, but hell, after 25 years of trying to build a replacement for the doddering former center on Broad St, anything will do. The interior is actually way more appealing, apart from head-scratching design flaws, like placing the dance floor over, not under, office spaces. The River Rock Apartment and Townhouse Residences is arising on the site where Flynn Tan tannery once commanded Boston St. The central apartment building is basically completed, being using now mostly for storage of construction materials, but cannot open for tenants until the six townhouses to its northwest are completed. Or the wait for opening could be even longer until the five townhouses to the southeast at 11 Goodhue St, where auto repair shops once operated, is further along than its current stage of framing the foundation. At the other end of Blubber Hollow, Ice Cream Way, a conversion of a 1917 Hood Ice Cream plant into ten condo units, with 19 new townhouse units across three buildings to fill the other corners of the site, rose on S. Mason St. The first seven townhouse units, folding in and echoing the design of a modest duplex Queen Anne home, are ready for purchase and occupancy. The Salem Oil and Grease factory at 60 Grove St, spread at one time across half a dozen buildings spanning the North River and empty for decades, is at long last, getting demolished. Another year and it might have fallen down on its own, so decrepit was the factory. Once demolished, perhaps by mid-2019, construction will begin on 140 new apartments across four low-slung buildings that will occupy half of the 8-acre site, the other half becoming landscaped garden space. Perhaps, if projected population growth continues in Greater Boston keeping housing in extraordinarily high demand, in coming years the other four acres could be filled in. Of the two oldest buildings of Salem Oil & Grease only these sorry foundations remain. Once torn out attention will turn to removing two bridges across the North River that once connected to the building beyond, then to that sturdier brick building itself. Of the sprawling Salem & Grease complex all that remains standing is the red brick building center-left and the garage building bottom-left. Next to Salem Oil & Grease, legal recreational marijuana sales, the first in Greater Boston, commenced just before Xmas at Alternative Therapies Group at 50 Grove St. Sales are brisk, and with the City of Salem collecting 6% on every sale, could put more than a million dollars into city coffers in 2019. With no other pot shops due to open in Salem for at least six months, likewise in Greater Boston, it appears that Blubber Hollow keeps pot excitement to itself for a considerable time. Not that everything is rosy. Redevelopment of the Salem Suede site on Flint St is on ‘sabbatical’ while the property owners searches for a new developer after the first two successively backed out. The plant is razed, but only serves now as a site for homeless encampments and burrows for the ever-present rats of Blubber Hollow. And the primo site in all of Salem, the corner of Bridge and Boston Streets, scheduled to be filled by a new Gateway Center with shops and ~150 apartments, is also on indefinite pause, a placemarking shed occupying the desolate corner. Both sites have been ‘under development’ for going on 30 years now. Such is fitful progress in Salem. And worst of all, redevelopment plans by FW Webb Plumbing for the former Universal Steel site at 301 Bridge St were fully withdrawn after local NIMBY’s succeeded in their policy of filing frivolous lawsuit after frivolous lawsuit until finally in exasperation the developer quit and left. Some fifty jobs departed Salem. More on this appalling development in later posts. And not a setback per se, but the warehouse at 63 Grove St, directly across from the Salem Oil & Grease demolition, has been empty for months, years actually, with a fraying For Lease banner hung over the front. It is enormous, 34,000 sq ft of floor space, built in 1953 at the time the local leather industry was disintegrating, optimism still high that the industry could ride out the downturn. It didn’t, and the building never was fully engaged. It’s in the best shape of any remaining factory building in Blubber Hollow, and an imaginative developer could turn it into appealing living space, what with it’s 200 yard stretch directly on the North River, almost all the way to Bridge St. But enough construction is ongoing to bring hope that with so many people moving in that urban amenities like those that once lined the streets of Blubber Hollow, markets and restaurants and pubs and cafes and the like, will yet return. Already, signs have appeared in the windows of empty 100 Boston St that New England Bakery of Maine is soon to fill the space, specializing in gourmet donuts. What with A&J King Artisan Bakers opening in 2017 up the road at 139 Boston St, and a ubiquitous Dunkin branch down the road at 68 Boston St, any cravings for calorie-rich baked goods in Blubber Hollow will be readily quenched. Pot users around the corner be alerted. Environmental consultants initially took seven boring samples from across the entire park, with only one boring, from the soccer field, indicating the presence of arsenic at the reportable level. Subsequently 10 additional borings were taken in the soccer field and playground areas. Three of those 10 secondary borings also exceeded the reportable levels of arsenic. Levels reportable to the Massachusetts Department of Environmental Protection (MassDEP) are >20 ppm, while >40 ppm triggers an immediate site closing. Three of the 10 secondary samples at the soccer field exceeded that 40 ppm threshold. Hence the immediate site closing! The immediate question: where did all that arsenic come from? The answer is immediately answered when a 1912 photo of the site surfaced, taken from a position in Gallows Hill Park overlooking what is now the Mansell Playground portion of the park. That immense six-story building is a tannery, a leather factory resident at 50 Proctor St for nearly 100 years. Home to the Acme Leather Co. and to the Cooke Bros. Leather Co. purveyors of fine sheepskins (the 1912 Salem Directory does not list the specialty of Acme). Today the tannery is gone, nary a trace remaining. To orient the viewer to current structures: the homes to the center left still stand along Langdon St; the basketball court is just to their right where a slag heap apparently stands in the 1912 photo; the soccer field extends from the middle of the tannery encompassing all the out buildings and the sluice pond. Mansell Parkway was built after the tannery was razed, as best as can be determined in the early 1950’s, and extends from the top right of the tannery down through the sluice pond. The gablefront house prominent in the rear is 58 Proctor St, still standing today. Just beyond it is 67 Proctor, odd Victorian tower still extent today. The barren ledge over the top of the tannery is Norman’s Rock, today the place of the Salem Heights affordable apartment complex; beyond that the former Salem High School looms in the distance on Highland Ave, today the Collins Middle School. Left of Norman’s Rock, off the left frame of the photo, is Proctor’s Ledge, where a Memorial to the Witchcraft Trials victims opened in 2017. A view of 50 Proctor St today, the Mansell Playground, from the opposite orientation of photos above. Langdon St to the right, Mansell Pkwy to the left, Gallows Hill water tower overlooking Gallows Hill Park in the center top. Just the lower portion of Gallows Hill park is closed, the portion outlined in the dotted red line. The skate park and upper portion of park remain open.Though Gallows Hill Park was established in 1912, one of the earliest parks in Salem, the contaminated Mansell Playground portion was only appended in the 1950’s. It could be that the arsenic contamination came from factory effluent dumped into the pond behind (see photo above), but the more likely source is the coal ash used to fill in the pond when the factory was demolished and the Mansell Playground created and joined to Gallows Hill park, sometime in the early 1950’s. Coal ash is notoriously high in arsenic. Coal ash would never be used as fill today, but doing so was common practice in the mid-20th century. After demolition of the tannery Mansell Pkwy was pushed through, and the houses now on that street, and the intersecting Looney Ave, were erected in the period from the late 50’s to early 60’s. The street and the park filled with Baby Boomer children, many of whom returned this past summer for an enormous block party. When they frolicked barefoot in Mansell Playground in the 1960’s the coal ash fill was fresh and its toxins near the surface; today after decades of subsumation the arsenic is a foot underground and likely not a threat to cheerleading practices held daily throughout the fall on that ground. The street and playground are named for Private Benjamin F. Mansell, a Gallows Hill native killed in action in 1944 in Italy. But how does a street barely 100 yards long with only three houses on its length, four if the corner split-level at 11 Looney Ave is included, merit the honorific parkway? Many detractors of the Haunted Happenings events that dominates Salem streets each October, thinking that the celebrations trivialize the horrid events of 1692 (and they do, but so what), try to put the focus instead on the maritime legacy of Salem. Those efforts never succeed, perhaps because the maritime legacy itself is trivial, lasting a brief generation with no lasting relevance on American culture, besides attractive houses in the McIntire District. Even favorite son Nathaniel Hawthorne saw it as such. A much grander, more lasting legacy is the leather industry, but it a legacy mostly disregarded. After all, look at the size of that factory in a residential area! One of more than a hundred such factories in and near Gallows Hill. Leather was King in Salem for more than a century, from the mid-19th century to the mid-20th century. A half century after the collapse of that industry the consequences linger: soil contamination in parks, deindustrialization of choice properties, battles over new development, pensions that senior citizens counted on evaporated, traffic and transit patterns designed for King Leather hard to redesign. It is a legacy that this blog intends to return to again and again. * With apologies to The Russians are Coming, The Russians are Coming. The Gallows Hill / Blubber Hollow neighborhood has seen its share of history over the years, but events this last week will highlight annals for decades to come. The opening of the ATG marijuana dispensary in Blubber Hollow at 50 Grove St marks the first retail marijuana shop in “dense” Greater Boston. Two other shops in western MA preceded ATG, but they are too far away from the mega-metropolis that is Boston to matter. Worries about a traffic apocalypse overtaking Salem turned out to be, not surprisingly, much ado about nothing. The reservation system put into place kept lines short and crowds of novelty seekers never materialized. More people seemed to be walking to the pot shop than driving. The pleasant weather over the weekend helped. Media reports and official pronouncements from the City of Salem finally noted that commuter rail and bus station is walking distance away. Casual observation noted many people making that walk, tamper-proof ATG bags in hand. ATG is likely to remain the only dispensary in Greater Boston for considerable time. Last week the Cannabis Control Commission granted final licenses to four more dispensaries, but all in the hinterlands of Massachusetts. Two even along the New York State border, closer to the Hudson Valley than to Massachusetts Bay. When all these open that’ll make eight outside the I-495 beltway, just the Blubber Hollow shop inside the ring, though population distribution of Massachusetts is close to the opposite of that ratio. It’s gonna stay busy! When news crews picked up their Dunkin did any bother to read the Blubber Hollow sign? The ATG opening coincided with the onset of razing of the last standing factory in Blubber Hollow, the former Salem Oil and Grease factory at 60 Grove St next door to ATG. Opened in 1912 at the site of the Trask grist mill, Salem Oil & Grease became noted the world over for supplying oil and grease products of all types to tanneries, dozens of which once filled Blubber Hollow. Not only leather oils, but automotive, engine oils and greases, as well as cod and other fish oils. To put the product mix with more erudition, lubricants and emollients of all purposes. All that was missing was a fragrant olive oil. Salem Oil & Grease fell on hard times with the slow-motion collapse of the tannery industry in the last half of the 20th century. By the turn of the 21st century the plant was abandoned and decrepit, photographs of its ruins on many a blog and Instagram post. After being closed and desolate for decades, the nearly eight acre property in 2011 was purchased by a consortium of property developers intending to build apartments at the sight. After much design and redesign in 2014 development plans were approved for a 141-apartment complex, provisionally named Legacy Park, to be spread among three four-story apartment buildings. Also included, a whopping, and excessive, 215 parking spaces. Since 2014 the start-and-stop foibles that seem to afflict every development in Blubber Hollow, hell every project in Salem, held up any further action at Salem Oil & Grease. At the same time as plans were approved the original co-developer backed out, and MRM Project Management of Beverly, owner of the land, had to spend several years seeking a new developer. It didn’t help that in the interim MRM itself had to file for bankruptcy reorganization. When things finally came together again, the project had to go before the Zoning Board of Appeals for approval of minor changes to the plans. Where before the project was strictly residential, in the new version some office and retail spaces are allotted at the front along Grove Street, opening the site to diverse purposes. In Jan 2018 ZBA finally approved changes to let development proceed. It took most of the year since to get a demolition team in line, but demolition has now started. The North River has been covered with an expansive platform to catch debris that slips out of the jaws of the excavator. Not too far into 2019 the remains of Salem Oil & Grease will be gone, the property vacated. The site is enormous, comprising nearly eight acres along the North River, between Harmony Grove Road, across from the immense Harmony Grove Cemetery, and Grove Street, wrapping around the ATG marijuana shop. The planned Legacy Park project will consume only four acres, even with the abject number of parking spaces. The rest will be set as green space, for enjoyment of residents and neighbors alike. It’ll be nice to get the North River corridor cleaned up. Former homeless encampments sprinkle the site, and dumping is common. A brief perambulation this morning along the North River uncovered what could comprise a full living room set: two sofas, a clashing armchair, two bureaus, a chest and a pile of lumber that might once have been a bookcase. The North River once was highly polluted, the jest being that the type of leather being produced upstream could be inferred by the iridescence of the water downstream. Over the past couple of decades the disgustingly polluted North River has been getting cleaned up, thanks to the efforts of the Salem Sound Coastwatch. Today a Great Blue Heron makes the North River its home base, feeding on the minnows and amphibians that have repopulated the waters, the occasional shopping cart and stuffed bear popping up in the gliding stream aside. Now if the great bird will only stay still long enough to focus the camera, maybe its portrait will grace this blog, instead of this grainy stock image.